LIDAR is all about measurement of the speed of light. Orchid’s new two board set measures the speed of light with precision to spare. This translates into unsurpassed low-noise spatial resolution. Implemented as a two board set, Orchid’s precision multi-channel infrared laser light detection system is assembled on a specially designed ultra-quite, shielded circuit board assembly. Multiple high speed transconductance ampliers interface with a photodetector diode array. That array is the source which provides highly sensitive light impulse data to the giga sample analog to digital conversion board residing below. Dual channel giga sample per second analog to digital conversion functions, on the y data analysis functions, data formatting functions, low noise power conditioning, and overall system supervision functions are implemented on an Arria 10 FPGA. Operating at 32 gigabits per second, Analog Devices AD9680 communicates over a high speed multi-channel JESD204B data link to an Intel PSG Arria 10 FPGA. On the y data processing is performed within the Arria 10 FPGA, making the whole system extremely efcient, low power and low cost. Leveraging years of giga sample ADC design, this board set is Orchid’s fourth generation of high speed JESD204B designs. Orchid’s has unmatched experience with low noise analog design, analog filter design, multi lane JEDS204B system design, custom FPGA algorithm design, and board level design/layout and rapid prototype construction. At 1600 mega samples per second, this JESD204B high speed analog system rocks. The development of custom electronic products for our OEM clients is Orchid’s entire business. Orchid has implemented similar high speed JESD204B data conversion systems for automotive LIDAR, medical OCT inteferometry imaging systems, and multi-channel software de ned radio applications. The design of high speed custom FPGA systems with rapid design cycles, demanding technical requirements, and unforgiving schedules sets us apart. Call Orchid Technologies today! 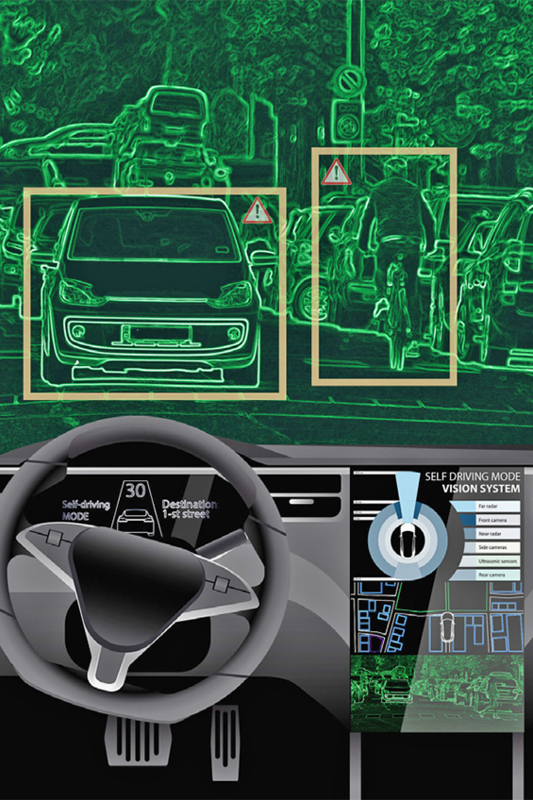 LIDAR environmental sensing is at the heart of the self-driving technology revolution. High speed analog detection circuitry, FPGA algorithm development and JESD204B technologies implemented by Orchid lead the way. "Orchid’s selection of the Arria 10 FPGA together with their implementation of the FPGA-based JESD204B processing chain greatly accelerated our time to market."